Posted August 29, 2012 by laurielmorrison & filed under Book Reviews, Middle Grade Literature, Posts with specific prompts or suggestions for specific assignments, units, and books, Teaching. I love to include read alouds in my middle school English classroom. That usually means choosing an effective read-aloud novel, reading somewhere between five and fifteen minutes per class, and giving students some time to discuss their reactions and predictions as we go. I find that read alouds increase students’ enthusiasm about books and lead to some very animated conversations. Plus, students (and I) really enjoy them. Last year, I started a new teaching job and was getting used to a new school schedule and a new curriculum. As a result, I wasn’t able to incorporate much reading aloud. 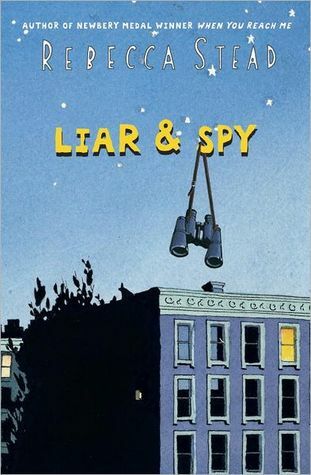 But this year, I am ready to integrate more read alouds again, and I’m excited to use Rebecca Stead’s new novel Liar and Spy, probably with my sixth (and maybe seventh) grade students. Stead’s When You Reach Me is one of my all-time favorite read alouds. Sarah on “The Reading Zone” recommended Liar and Spy as a terrific read aloud (and shared some excellent activity suggestions which I plan to use), and as soon as I started the book, I knew she was right. But what characteristics make a book an effective read aloud? Why do Rebecca Stead’s novels lend themselves so well to this format? When You Reach Me and Liar and Spy are pretty different: When You Reach Me features time travel and takes place on the Upper West Side in the late 1970s, while Liar and Spy is a contemporary realistic novel set in Brooklyn. But both novels feature a likable main character with a distinctive voice; deal with relatable family, friend, and school issues; invite readers to think about big, philosophical ideas; and encourage readers to piece together clues. For me, these characteristics (a compelling protagonist/distinctive narrative voice, relatable themes, opportunities for abstract thinking, and opportunities for making inferences) lead to a very successful read aloud. Liar and Spy tells the story of Georges, a seventh-grade loner who is teased about the silent “S” at the end of his name and who has to move from his beloved house to an apartment after his dad loses his job. Georges is funny and smart. He makes spot-on observations about his classmates, his teachers, and his dad, but he holds himself apart from other people until he gets to know a dog-walking, scrambled-egg-cooking, spy-enthusiast new neighbor named Safer. Stead deals with bullying in this novel, but she does it with humor and without melodrama. Georges knows that he is dealing with what his mom would call “classic bully crap” and is hurt by the way some of his classmates treat him, but he doesn’t feel sorry for himself. He maintains his sense of humor, and with the help of his classmate “Bob English Who Draws,” he is ultimately able to create his own group of allies who refuse to follow some of the “rules” of middle school. Rules are an ongoing motif in this story—especially rules that don’t work logically or consistently, like the rules of spelling, taste, or where people sit at lunch. While Stead gets readers thinking philosophically with her veil metaphor in When You Reach Me—the idea that most people walk around behind an invisible veil that keeps them from seeing all of the beauty and pain around them—she encourages us to think about the benefits of focusing on the big picture versus the “dots” in Liar and Spy. Georges is named after the French painter Georges Seurat, and his parents have a print of a Seurat painting that is made up of thousands of dots. Georges can only make out the shapes if he stands back and looks at the whole thing. “Like Mom says,” he muses at one point, “life is a million dots making one gigantic picture. And maybe the big picture is nice, maybe it’s amazing, but if you’re standing with your face pressed up against a bunch of black dots, it’s really hard to tell.” He tries to keep himself from fixating on the “dots” of day-to-day life, but in a poignant father-son scene he comes to realize that, “Life is really just a bunch of nows, one after the other,” so both the dots and the big picture matter. Throughout the course of the novel, Stead also raises fruitful questions about what makes something a game and what it means to lie. Liar and Spy encourages and rewards close, thoughtful reading, because Stead lets readers make inferences about Georges and Safer—what they aren’t quite honest about and what they don’t want to acknowledge. Therefore, teachers can guide students through the process of inference-making and let students share their predictions, their evidence for those predictions, and their reasoning. Reading this book aloud will let students practice analytical reading with some teacher support. As an added bonus, Liar and Spy is fairly short, so it won’t take too long to get through as a class. What do you think makes a book an effective read aloud? Any characteristics you’d add to my list? Any other favorite read-aloud books to share (or for non-teachers, any books you’d choose to read aloud to a group of kids if you ever got the opportunity)?